The Heat Saver Loan, brought to you by the Vermont Department of Public Service, Efficiency Vermont, and the Vermont Low-Income Trust for Electricity, is available to residential customers who are looking for an easy, affordable way to finance a home heating or thermal envelope upgrade, including domestic solar hot water and pellet heating system installations. When the customer finances his or her energy-efficient upgrade with the Heat Saver Loan, they can use the savings generated by their upgrade to help repay their loan. There is no minimum loan amount, and the loan will cover up to $35,000 in costs. Eligible applicants will receive loan approval within 2 business days. Customers applying for a loan for a domestic solar hot water or pellet heating system must use a CEDF Approved Installer through the Vermont Small Scale Renewable Energy Incentive Program (SSREIP)“CEDF Approved Installer” designates domestic solar hot water and central wood pellet installers who have had a reservation with the SSREIP since January 1st, 2014. Please contact the Renewable Energy Resource Center if you are listed and wish to opt out, or if you wish to be added to the list. Financing at rates are between 0% and 4.99% depending on income. Looking to find an installer? 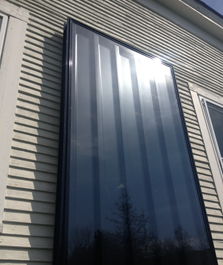 Contact us now for a free estimate on your solar heating or solar hot water system. In addition, we offer solar PV installations, as well as several other home energy services, including comprehensive home energy audits to homeowners across Vermont. Formed with a vision to help the environment, keep money local, and get people talking about renewable energy, Harvestar is driven by a passion to promote sustainability and clean technology.